This is a call-out to arms fair resisters across the world to join a Skype conversation with other grassroots activists. With arms fairs due to be held in Brno (Czech Republic), Ottawa, Tel Aviv and France all within the next couple of months, we have a lot to talk about. The arms trade is a global phenomenon and arms fairs are the nexus of this trade. They are the physical sites which bring together those who manufacture, profit from, orchestrate and deliver suffering and death. They facilitate the encounters in which the maker of an opening mechanism meets the merchant who installs it in a fighter jet and then sells it on to the government functionary persuaded of its necessity by the military representative who will later instruct the crew of the bomber to use it to open the cockpit to enter the plane to take to the skies and sow death and destruction across the countryside and cities below. As the arms trade is a global phenomenon so is our resistance global, with actions against arms fairs taking place worldwide and increasing levels of transnational activism reflecting the global reality and consequences of this trade. At the War Resisters' International Council meeting in Seoul in 2015, activists from all corners of the globe travelled to stand in solidarity and common cause with Korean arms fair resisters protesting the ADEX arms fair and will do so again this coming September in London when they participate in the week of action that has been called to stop the DSEI arms fair. The physical sites where death is commodified and turned into cold, hard cash are the sites of our resistance; tangible places and moments in a shadowy and often elusive world of money and death where we can intervene; obstruct, challenge, expose, block. The arms trade happens everywhere and so we resist it everywhere. 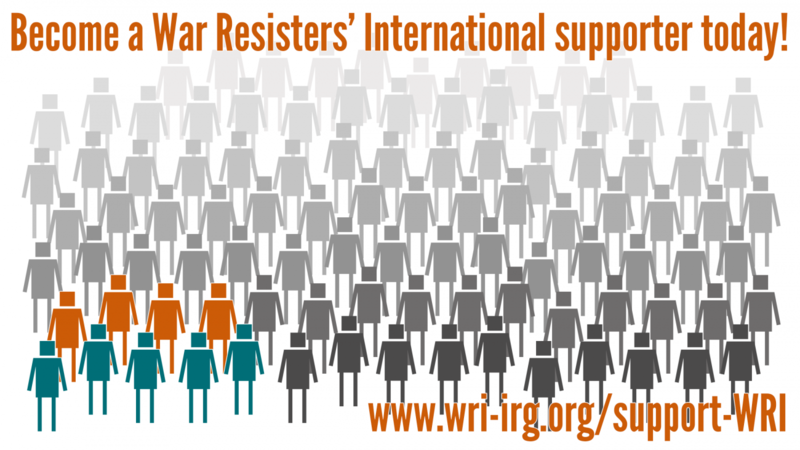 War Resisters' International is reaching out to grassroots activists taking action against arms fairs across the world to come together to build on our existing connections and work more closely in our resistance. We want to build solidarity, share what works, support each others' actions and talk about what more we can do together as a movement. We are hoping to begin by starting a conversation via Skype and then seeing where this takes us. Please contact us at sarah@wri-irg.org if you are interested in taking part and we will send out a doodle poll to set a date for the call.